With facilities specifically designed to house stage productions, we aim to provide you with the finest theatre-going experience possible when attending an eventg at the Doudna. are involved in departmental productions. The Theatre Arts major at EIU offers a broad-based curriculum designed for the undergraduate student. 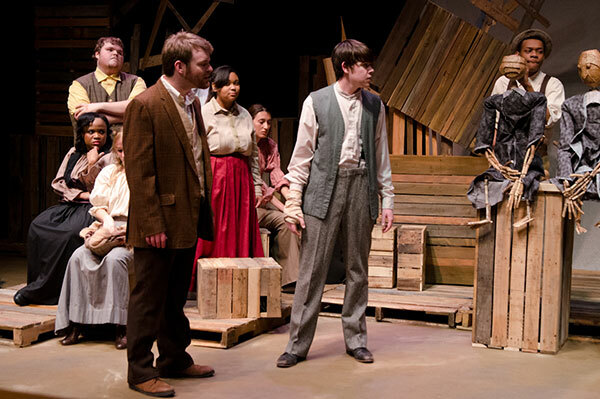 At Eastern, you will find a wide range of courses, from theatre history to dramatic literature, from basic acting to dialects, stage movement and scene study, and from basic stagecraft and costuming to scenic lighting. From the moment you begin as a Theatre Arts Major or Minor, you will find yourself immersed in the program with the ability to participate both onstage and behind the scenes. Our program focuses on the undergraduate student, and our philosophy is that the best way for you to master your craft is to be actively engaged from the onset – both in the classroom and in production. You’ll be engaged; you’ll be busy! And you’ll be doing what you love. And all the while, you’ll be learning and growing as a theatre artist. We strive to offer our students a wide and inclusive range of theatrical styles of production during their time here at EIU. Our season selections come from such diverse genres as musicals, classical and period plays, contemporary dramas and comedies, and children’s theatre. In addition to our six-show season, each year, the Department of Theatre Arts also produces a Children’s Theatre Tour that travels to area schools. Other opportunities can be found in the performances of Hello Dali, our improv comedy troupe, Lunchbox Voodoo, our sketch comedy troupe; and through EIU Dancers, which is co-sponsored by the Departments of Theatre Arts and Kinesiology. The EIU Department of Theatre Arts is housed in the newly renovated Doudna Fine Arts Center. Our home since 2008, the Lumpkin Theatre Wing houses The Theatre, a 290-seat proscenium; the Black Box, a flexible space that can be configured in various arrangement from arena to thrust to proscenium; and the Movement Studio, which is a flexible performance laboratory. Click here for more on our facilities. Anne Thibault comes to EIU from the theatre faculty at Columbus State University in Georgia, where she also ran a citywide arts program for at-risk and incarcerated youth, Empowered Youth of Columbus. Anne has worked professionally as an actress, playwright, and director for over twenty years and holds memberships in the Actors' Equity Association and Voice and Speech Trainers Association. Nick joined the faculty of EIU in 2008. He is excited to continue teaching and designing for EIU Theatre Arts Department. 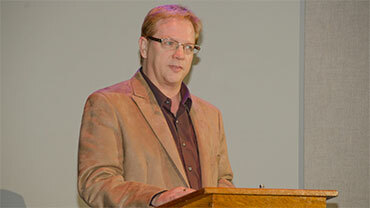 He has the fortune of designing the scenery for the EIU Theatre Arts Departmesnt. Some of his favorite designs are; Brighton Beach Memoirs, Shape of Things, Fiddler on the Roof, and Urinetown. J. Kevin Doolen (M.F.A in Directing from the University of Illinois) is Professor and Chair of the Theatre Arts Department at Eastern Illinois University. Prior to coming to EIU, Doolen was Professor and Head of the Department of Theatre at Oklahoma State University where he had been recently named The Mary Lou Lemon Professor of Theatre and for five years prior to OSU, was the Chair of the Department of Theatre at the University at Albany/State University of New York. Professor Doolen has remained active as a director in professional theatre – primarily focusing on new play development. "EIU Theatre offers a well-rounded education in the field, but also allows for students to emphasize in the specific field they wish. I feel this is the best kind of education – one that allows students to expand, but expand with a great faculty and caring students." 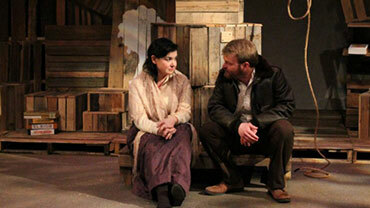 "The EIU Theatre Department is like home for me. I'm getting a well-balanced education from an incredibly talented, hard-working, and dedicated faculty, among classmates that have continued to inspire me every day I get to work with them. Every day, I learn something that furthers my passion for theatre." "I transferred from Parkland Community College to Eastern Illinois University because I liked the small campus size and beautiful scenery. And right away I had my pick of multiple responsibilities and opportunities within the Theatre Department. I plan to use every opportunity I can before I am done here." "Eastern's Theatre Department has made me feel like I belong somewhere, it is like Hogwarts. You can take technical or acting classes, and be well rounded in all aspects, like myself, or focus on one. You can also learn so much from our professors who will take the time to sit and talk with you, even if it is just about a book. Those are a few of my many reasons why I love it here." 2080 Doudna Fine Arts Cntr.